The Point Pony Trekking & Horse Riding Centre in Ballyconneely, Co. Galway. We are offering you a unique opportunity to discover some of the most breathtaking scenery in the West of Ireland on horseback. Our riding centre is situated right beside the Atlantic Ocean and the famous Connemara Championship Golf Links. All our rides are accompanied by experienced staff. 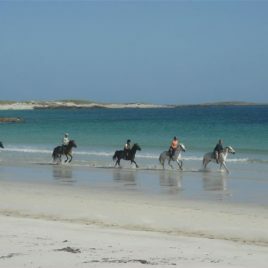 They will guide you and your horse safely along the dazzling sandy beaches and through wide open countryside. With the Twelve Bens as a backdrop, the Atlantic Ocean at your feet, the picturesque fishing village of Roundstone and the colorful town of Clifden only a few miles away, it doesn’t come any more scenic than this!